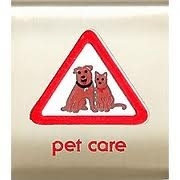 Care for your pet for two weeks. Make a list of the tasks that you did to take care of your pet. Read a book, explore the Internet (with your parent’s or partner’s permission), or acquire a pamphlet about your pet. List three new interesting facts that you learned about your pet. Make a poster about your pet. Share your poster with your den, pack, or family. With an adult, develop a plan for someone to care for your pet if you were to be away for one week. Train your pet to do a trick or follow a simple command. Describe how your pet communicates with you and other animals. Observe or play with your pet for 15 minutes each day for one week. Keep a chart that shows your pet’s mood on each day. Attend a pet show. Report to your den about the show. Make a drawing of the cage or bed your pet requires. Describe the important parts of it. Visit an animal shelter. Explain the reasons why pets are in the animal shelter to your den or family. Visit a pet store. Make a list of the different animals in the store and the kinds of foods they eat. Talk to a veterinarian about his or her career. Share what you learned with your den or family. Do a service project for an animal shelter, exercise an elderly person’s pet, or help a friend with the care of his or her pet. Find out about the pets of U.S. presidents while they lived at the White House. Tell your den about one president and his pet(s).